I've been working on this post for a few days now. 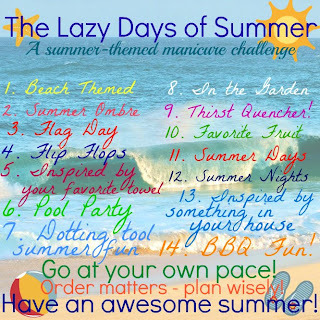 It's the 7th theme for my Lazy Days of Summer Challenge - Dotting tool summer fun. The first idea I had was a complete FAIL. I didn't even take pics, it was that bad :/ So then I was stuck on what to do next, when my hubby comes home with a new tie!!! It was perfect! Dots and all. My last giveaway included a comment for what you would like to see more of. Tutorials was top on that list, therefore this post will be lengthier and include some behind the scenes photos ;) So here you go!! I'm super happy with how this turned out. The inspiration! 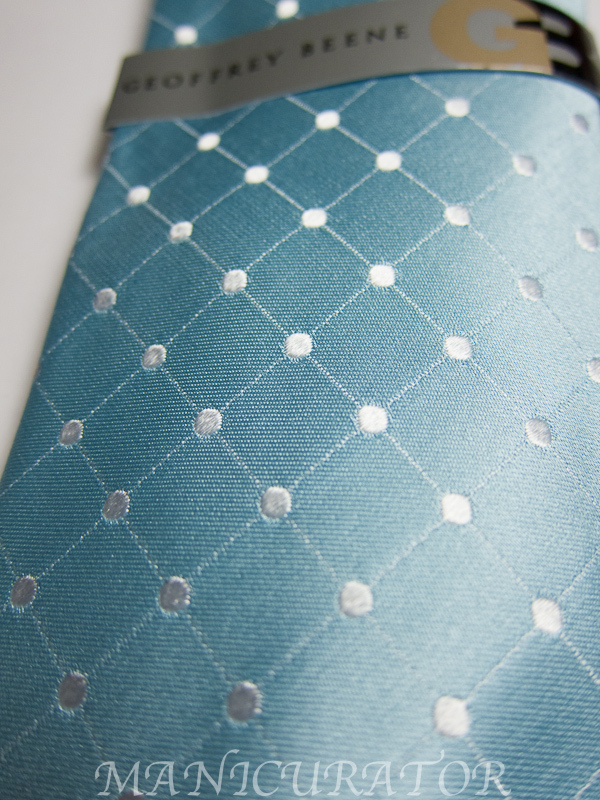 My husband's new tie! OPI My Boyfriend Scales Walls. LOVE. For this design I started with base coat and 2 coats of MBSW. Then cut sections of striping tape and painstakingly apply and re-apply until they look right and even. I did all the bottom ones going in the same direction first, then a second round of strips on top, perpendicular to the first lines. Make sure the tape is pressed securely onto clean DRY nail! 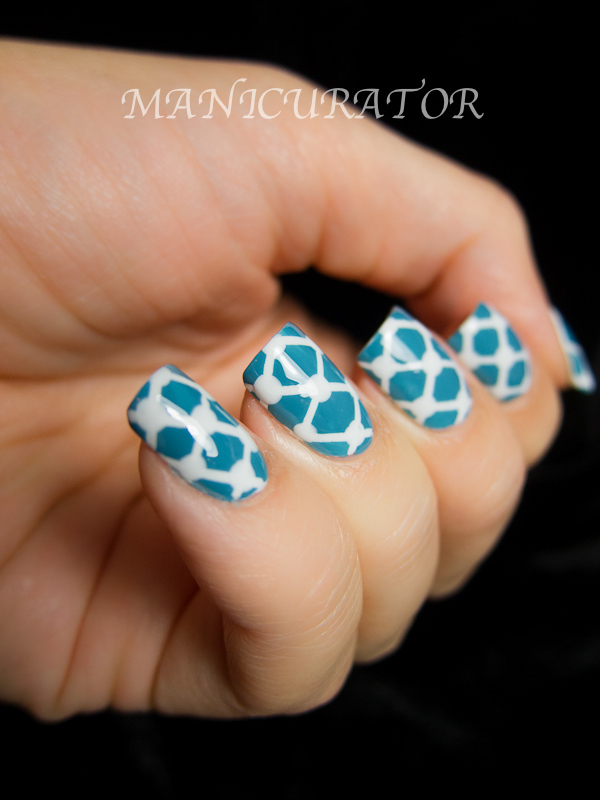 Paint over the whole nail with an opaque polish. Galahad is perfect for this. Then lift each strip carefully, starting with the ones you laid on top first. Then remove the bottom strips. I always do one nail at a time, because the tape can get in the way if you tape up all your fingers first. Be super careful, obviously, to not smudge all your hard work while getting the other nails done. This image shows after I painted over the strips, and already removed the top layer. Mostly done! This is what it looked like before I added the dots! 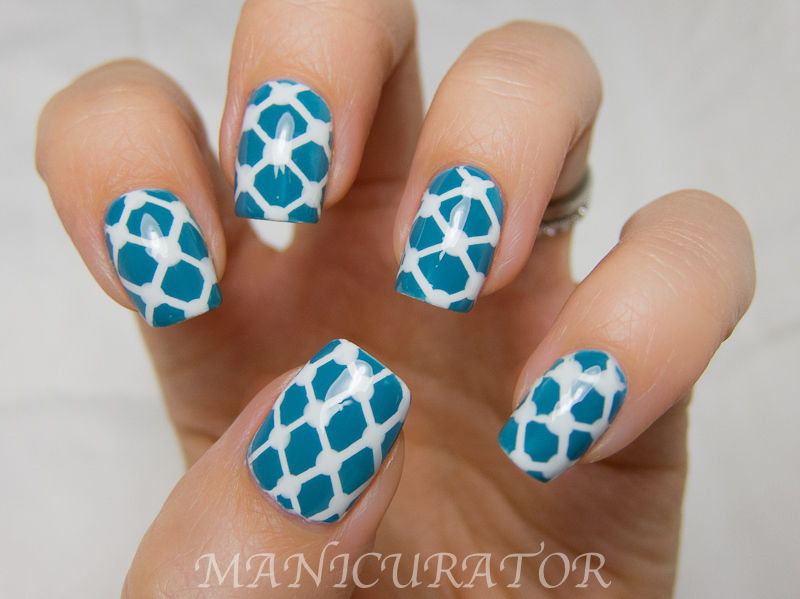 I let this dry a bit then added dots with my dotting tool to each corner and finished with Seche Vite. I'm really thrilled with how these look as you can see by the abundance of photos!! I actually narrowed this down from 71 pics. I figured that would be a little over kill :P I somehow managed to do my other hand too, and it came out just as nice! People I came across could not believe these weren't nail stickers! These are so beautiful! I am definitely going to try this! Amazing! You are so good at nail art!! Perfection. 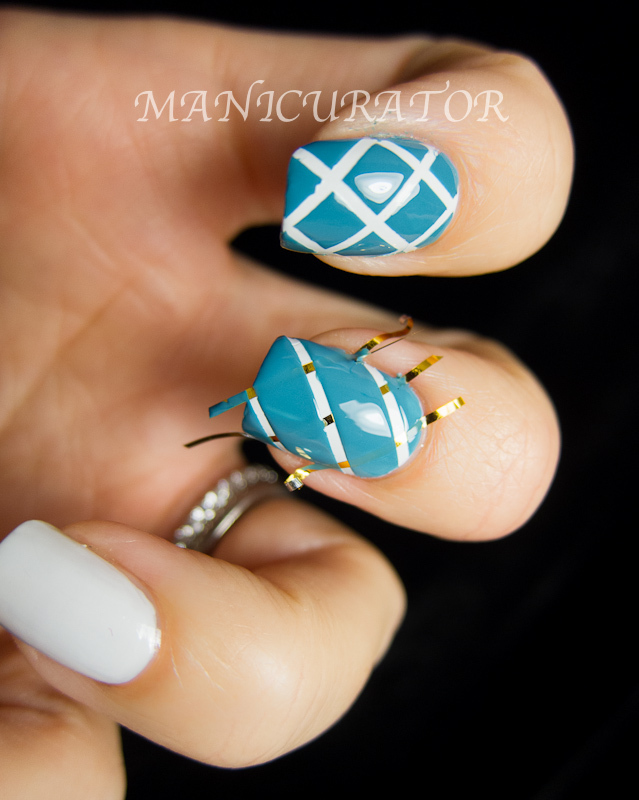 Wow awesome looking nail art!! This makes me extra excited about the striping tape I bought last night! They're amazing! I want this look so bad but I don't think I'm as patient as you haha! Well done! Lovely pattern! 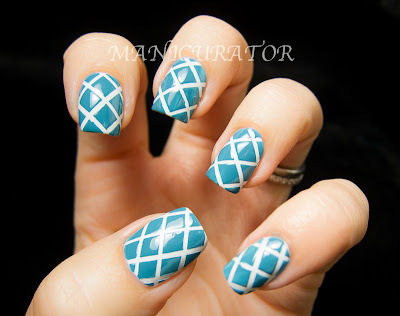 I might try this with a different method since I don't have striping tape. Perhaps a striping brush or a stamp which I add dots to later. wow stunning and your pictures are so gorgeous! 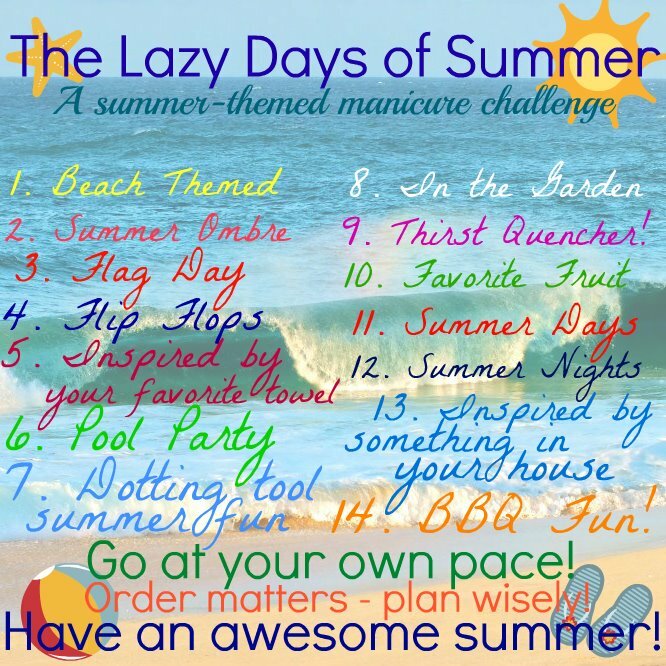 This is awesome- I will have to try this! You are soooo talentes, love it! I love this so much, it loos great!! WOWOWOWOW! I am amazed at how awesome this looks! Totally matches his tie as well! 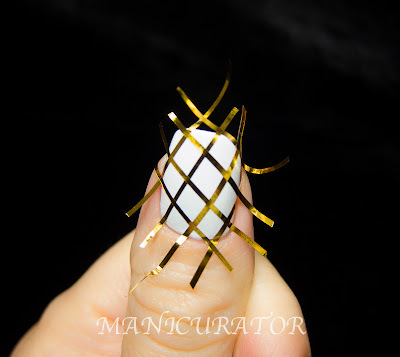 I don't have the patience for the tape bit-maybe I can do the dots and try to connect them with a brush to make the lines. This is amazing and very well done! I just love this!! Great job. Everything about this is absolutely perfect! Love, love, love it! Wow that is amazing! Love it!!! Beautiful! Thanks for the tutorial. 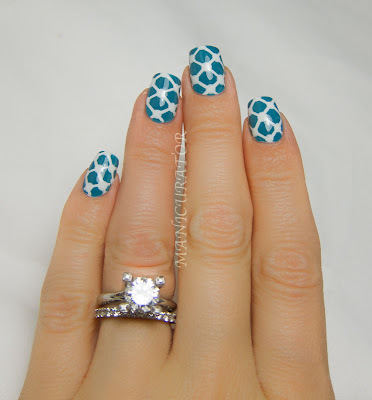 This is the kind of nail art in think I can do (with patience and practice). Freehand art is not my thing. How Fantastically Gorgeous is this?!!! 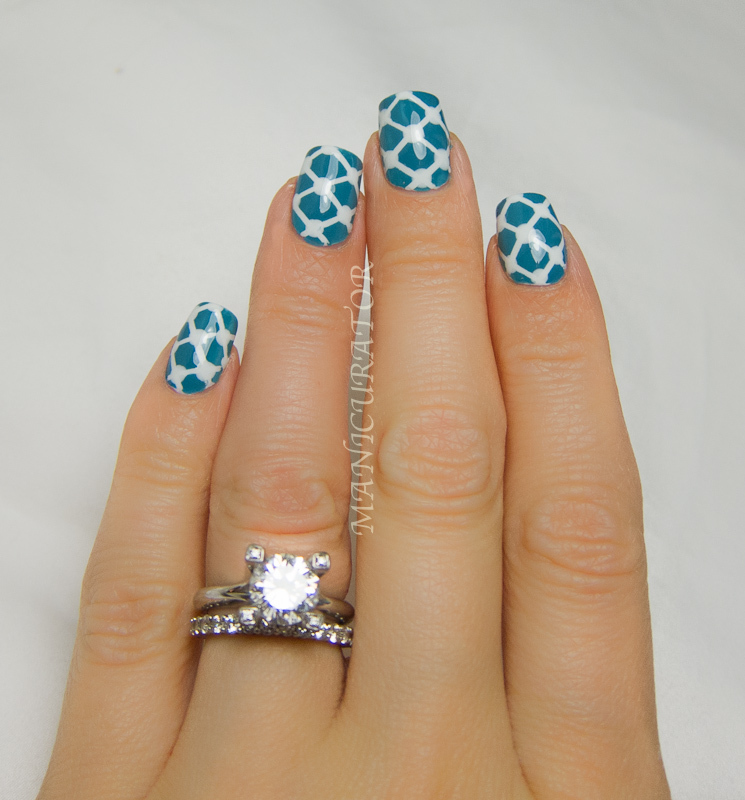 *Swoon* your pictures are always perfection, and so are your nailbeds! Daaaaamn, they are hot! LOL You're my nailart hero! 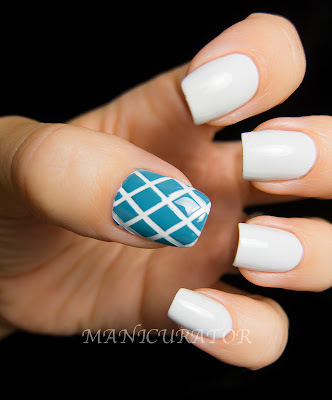 I'm actually a visual artist, but I've always been super scared to try any nail art, since I'm generally a polish newbie as of this past year. I tried a simple dotting pattern last spring, and I didn't really like it, so I never tried anything again. I looked through dozens of your nail art posts, and they are extremely inspirational. Now, I'm going to invest in some nail art supplies and go to town! Thank you for inspiring me! I'm so excited!